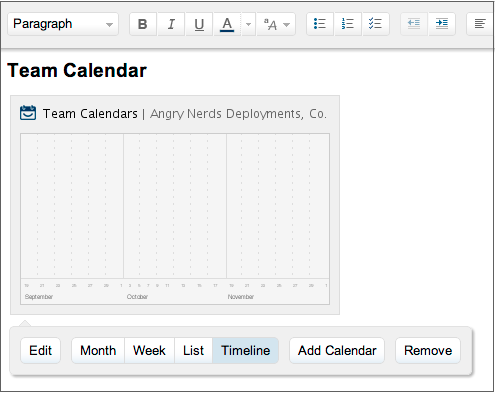 The Atlassian Team Calendars team is pleased to announce the release of Team Calendars 3.0. This release was focused significant JIRA calendar improvements as well as a brand new Timeline view. Planning releases? Zoom out to a three-month view. Using JIRA for change management? Zoom in to 15 minute blocks and see the details on your scheduled outages, deployments and environment bookings. Quickly change zoom levels by using your mouse to zoom in and out. 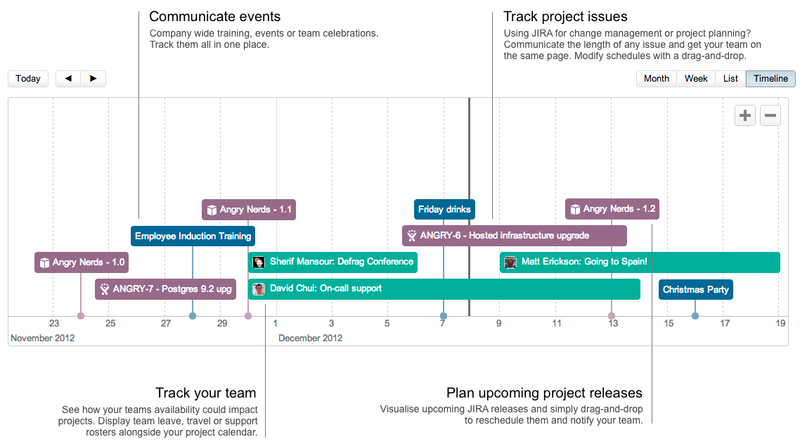 Drag and drop your JIRA issues, releases (versions), people and company events to re-schedule them. Re-scheduling any JIRA item automatically updates JIRA for you and notifies your team. Creating new events is just as easy as month and week views. Just double-click on any time to create an event. Whether it be your project, team or IT homepage, you can embed calendar timeline views in any Confluence content. IT teams using JIRA for this use case and scheduled outages have an approval workflow to track the change as well as important dates such as scheduled deployments, upgrades or system outages. Many IT teams have shared test, dev or staging environments. Communicating who has what environment booked for testing is often a tedious and time consuming task. Some customers are using Team Calendars out-of-the-box to map this out, while others have JIRA project setup with an approval workflow to cater for their specific needs. Thirdly, many customers are using JIRA for annual leave tracking. They've got a workflow setup to capture management approval for leave and travel requests. In addition to their workflow, they also have custom date fields setup to capture the leave start and end dates. Implementing one of our top requested features, you can now visualize the start and end dates of any issue you have in JIRA. When creating a new JIRA calendar, not only can you add a single date, but you can now select a date range. For those of you with complex setups, you can add multiple date ranges in a single calendar. You can select any custom JIRA date field as well as the out-of-the-box "Issue created date" and "Issue resolved date" . Those date fields can be displayed as single dates as well. Visualizing any custom business process in JIRA with your own date fields is super easy with Team Calendars 3.0! A new calendar color scheme has been introduced which has better color contrast so it's easier to scan. We've given our icons a bit of a polish and refresh. (Previously we only supported this for standalone). We are measuring the opens of Team Calendars from the notification to work out how effective this method of discovery is. Alternatively, download the latest release from our plugin exchange and install it via the Plugin Administration screen. This should upgrade Team Calendars to 3.0.0 (or higher). To do this in JIRA, simply click 'Upgrade' in the jira-ical-feed entry of the Plugin Administration screen. Alternatively, download the latest release from our plugin exchange and install it via the Plugin Administration screen. This should upgrade Team Calendars for JIRA to 1.0.11 (or higher). Note: The JIRA plugin upgrade is completely optional and not required if you are not using JIRA Calendars for Team Calendars.